Seems there's no translation of the interview yet. Hopefully, this translation of a translation will do for now =) Feel free to remove this if a more accurate translation comes along. Let me know if there are any phrasings to be changed. Congratulations to you all on the win. How are you all feeling? Innovation: This win was a really hard win, and so that makes me even happier. During the games, there was a moment when I felt that I was going to lose, and to be able to come back from such a situation makes me even more happy. Crank: I prepared a lot, but we were unlucky yesterday. It felt like the tactics I had prepared all got countered. It felt really horrible. I tried very hard to recover our morale, and from the results today it seems like it worked, and I'm very happy. Alicia: My PvZ win-rates aren't too bad, and so I was confident and played very well. I definitely had a disadvantage on the map Haeundae, and so I chose an improvised strategy, and I'm very happy to be able to win. However, I had wanted to finish off the series myself, but wasn't able to do so. It's such a pity (laughs). The games were very tight. Innovation: On Frost, I had basically already lost, based on the situation that the game was in then. I was barely able to get out the hellions and vikings, and won with a single push to turn the game around. In the ace match, there were many situations where I was at an advantage, but because I wasn't very experienced with how to respond to them, it became a very hard fought victory. You lost the first leg of the finals 1:4. Crank: Ever since the match-ups were announced, I began practising defending against the 11/11 rax, about 100 games. I decided to change my opening before the game, and my opponent actually used the 11/11 rax in that game. If I had believed in myself, it would definitely have been a win for me. It's such a pity, and I felt even more worse because of that. The atmosphere didn't seem very good after that loss in the first leg. Crank: All of us have plenty of competition experience, and we all knew it was not the end. We had the confidence that we would win today, and because of that confidence, we were able to achieve victory in the end. 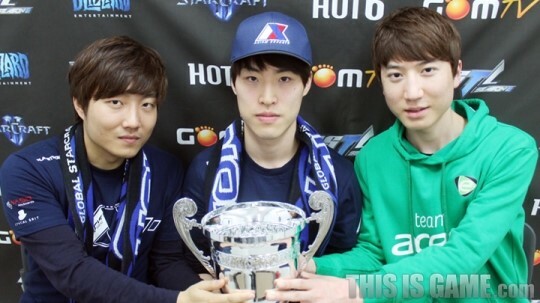 You are the only person to have achieved championships in both SPL and GSTL. Innovation: When I won the SPL on STX, I think the role I played was that of the team's ace. Today, when playing in the final game as well as the ace match, I suddenly recalled the scenario during those times. I was determined to play the role of an ace on this stage too, and so I was even more focused on playing the games. You ran into Supernova again in the ace match. Innovation: My TvT isn't really good, and so I was very worried, but when compared with Supernova, both my skill and experience don't lose out to him, and because of that confidence, I was able to win. With this championship win, you smashed the comments and views that your roster is too thin. Crank: The players are all very strong mentally. We don't care too much about what other people think, and we all really believe in ourselves, and this is also the reason we have been able to make it so far. You will be missing the Hot6ix Cup as you'll be taking part in an overseas tournament. Innovation: I actually wanted to take part in the Hot6ix Cup, but the team wanted me to take part in the ASUS ROG tournament. If I had known about the schedule earlier, we could have done some coordinating to resolve the issue, but it's too late now. The schedule for Dreamhack and TeamStory Cup will be connected, so I chose to take part in the overseas tournament. Most of the official tournaments are over now. What are your plans from here on? Crank: As mentioned earlier, we'll be dropping by Germany for TeamStory Cup, and will still be able have a break, but there probably won't be too much of a change. Alicia: Axiom vs. Acer would be very interesting. I think our team might win (laughs). Innovation: I'm quite weak when playing against people in the training house (laughs). As compared to winning, being happy and enjoying the tournament probably takes priority, so I don't really mind. Part of the plan for WCS next year has been revealed. Crank: Even though there are some changes in terms of the prize money and the finals, I don't think we are in a position to pass any irresponsible remarks without any solid results. If you have the ability, it doesn't matter how they change it. We won't care too much about it either. As long as we put in our greatest effort, it's good enough. Any last things to say? Innovation: I'm really very happy to be able to win GSTL. I want to thank all the people who support me, and I hope people will support our team even more in the future. I also want to thank Team Acer and the CEO. Alicia: There was a big crowd watching today's finals, and everyone had a great time watching, and I'm also very satisfied. Just one thing though. I still feel it's such a pity I wasn't able to close off the series (laughs). I hope people will still cheer for us next season, and I want to thank our sponsors, WASD keyboards, Planetside 2, Cynical Brit, John Bain, and Jenna Bain. Crank: I have learnt many things from the more senior players, and one of them is that a professional player speaks with his results and his skills. With this opportunity, I can proudly be able to say that. It took a lot of hard work to reach this stage, and I really want to thank and am very grateful to John and Genna Bain who helped us so much. innovation follows tech news? as he is thanking acer ceo, due to recent drama over there. Think Team Acer has a different CEO from Acer. What....? Innovation is missing Hotsix cup for an Asus Rog. Really? Well I guess the bright side is they can hopefully invite sOs. Acer benefits more from sending him to foreign tournaments I guess. Thanks for translating. It was a great finals, really enjoyable. As compared to winning, being happy and enjoying the tournament probably takes priority, so I don't really mind. Thanks for the translation yo! Maybe there was a systemerror, so they rebooted. Innovation... laughed? O.o there is a god. "Nestea. We're all just Nestea. The weird thing is, Nestea is Nestea in real life. And we just pretend to be him in this video game." Congrats Axiom-Acer! Great work this season!